Lucy's Quilts: Where have the days gone? It has been two weeks since my last post and I am not sure I can tell you why! I suppose part of it is that the weather has improved and I have spent a good bit of time working outside. The beds out there are looking better but still not great for the most part. Last year's onions, this year's carrots, chives and kohl rabi are growing well along with some volunteer pansies and tomatoes. I also have acorn squash, pumpkins, zucchini and green beans up. The strawberries are giving us a few berries which is good considering they were just transplanted a few weeks ago. The raspberries will give us a few berries also. I am hoping they will do better next year after I get them transplanted. The gooseberries are ripening and the blueberries seem to be doing well. As for work in the sewing room, there has been some of that. I got the main part of the quilt for my neighbor for our quilt exchange. 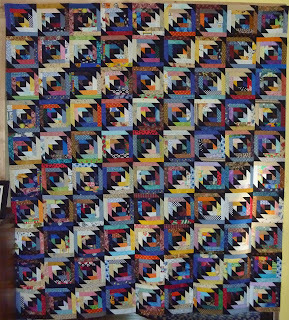 It still needs borders and quilting but that can wait as the quilt doesn't have to be done until November 1. 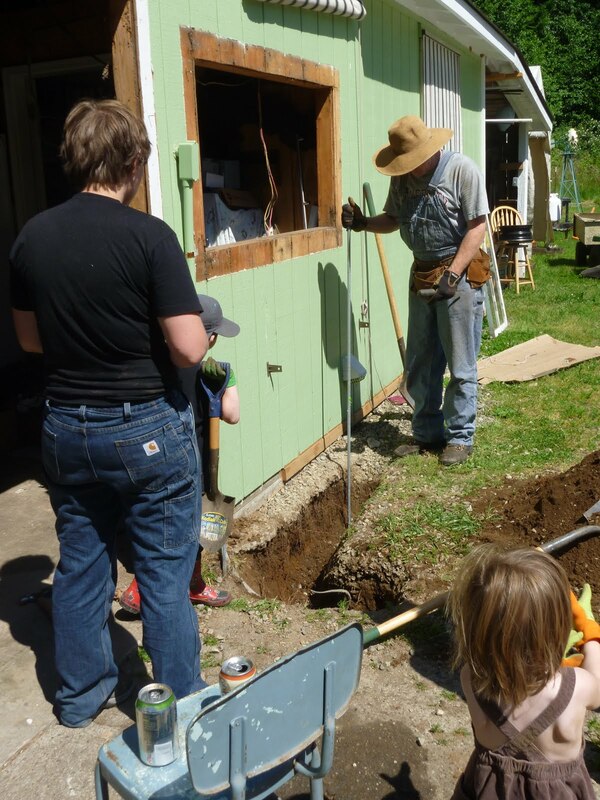 The original plan for the 4th of July weekend was for my niece to come over so we could play in the sewing room while my husband ripped the garage apart for a new and larger garage door. 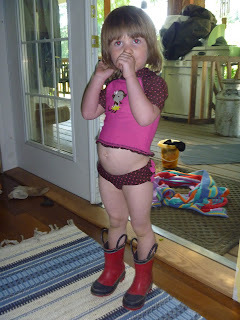 It changed when my daughter realized she had a 4-day weekend which meant she could come over for a visit with the kids. She hadn't been home since last fall sometime though the kids have been here several times on their own. They arrived on Friday and both kids and the dog were so happy to get out of the car and run! Chelsea helped her dad with the garage project and Katie and I had fun with the kids and took care of the meals. We did get some sewing in but not much. The kids got in a trip to the local beach on Puget Sound and even got an ice cream treat from the little store there. This is a tradition that was started when I was little girl and my great-uncle would take us down there for treats. 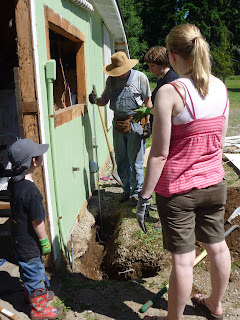 There was also running through the sprinkler, riding bikes and 'helping' in the kitchen and with the garage work. Chelsea and the kids headed back home on Monday morning and Katie and I got to work in the sewing room. Our project - the scrappy Geese Atop Your Cabin with black geese. We finished up the first 32 blocks and decided to head to JoAnn's to find some outdoor fabric to recover a chair my husband got at a garage sale this weekend. We got some brown that wouldn't have been my first choice but was the best available and it was on sale! We also got a kid's swimming pool for the grandkids' next visit. 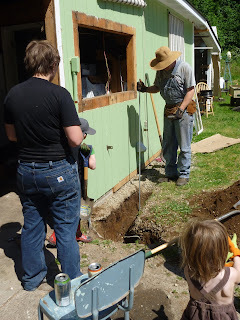 We even let my husband tag along since he had a sore thumb and couldn't work on the garage. and Katie had my remaining 1.5" scraps sorted and cut into either 1.5", 2", 2.5" or 4.5" pieces. As we worked we had come up with plans for all the pieces so that basket would be empty for at least a short while. Katie headed home so she could be ready for giving piano lessons in the morning and I headed over for craft night. While there I was able to finish off the last of the owl hats I had made. I now have 8 on hand but 4 of those were made to order and I need to contact the 'orderees'. and then spent some time outside working. Yesterday, I needed to get a skirt made for my little granddaughter who turns 3 on Sunday. I had gotten Figgy's Bubble Skirt Pattern at Fabric Depot back in April and got the corduroy to make two skirts but hadn't gotten around to it until now. I made the first one and it just looked too big so I made another smaller one. Hopefully one will be right for her! Then I ran to Target for a t-shirt to go with them and Costco for a swimsuit for her (we have been looking for one that has a UV protecting shirt to go with it) as last year's suit is allowing an awful lot of tummy to hang out! Stopped at the post office on the way home and got the package in the mail so hopefully she will have it by Monday, if not Saturday. I also added 2 borders to the the little scrap quilt I started on Wednesday. The first was a light neutral fabric followed by most of the 1.5" X 2" pieces sewn together. 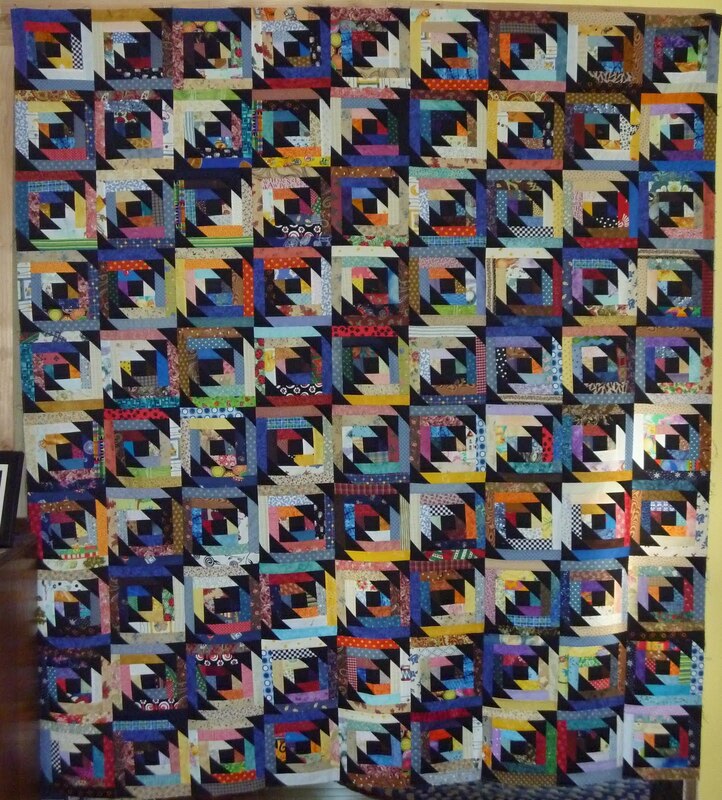 I am thinking I will add another neutral, probably a darker one, and a row using the 1.5" X 4.5" pieces. Oh, I almost forgot! On Friday evening, we got my clotheslines up! It was so great to be able to hang the laundry outside this weekend and the sheets and towels after the company was gone!